The simple yet sophisticated lines of a marquise cut diamond make it one of the most popular choices for engagement rings. Knowing what makes this particular diamond shape special and how it affects the other characteristics of the gem is crucial for couples who plan on choosing a marquise stone. Bridal set: A bridal set, such as the Marquise Diamond Bridal Set from Zales, is a beautiful example of how the engagement ring and wedding band are incorporated with a marquise stone. This ring comes in either white or yellow 14K gold and features a center marquise diamond accented with channel-set round diamonds. Offset accents: The tapered stones pair particularly well with oval, round, and pear-shaped accents in offset bands where the setting is uneven on each side of the center stone for additional visual appeal. An example of this design is the Offset Marquise Cut Diamond with Pass Through Band. Solitaires: Solitaires, like this simple and stunning 14K White Gold Solitaire that showcases the diamond with a polished bezel, can also be found. Many jewelers offer designer styles utilizing the bold and dramatic marquise shape. Classic prong setting: The best setting for marquise diamond engagement rings is the classic Tiffany or prong setting. Four prongs secure the long body of the gem, while two additional prongs cover the tips to protect against chipping or fracturing. The Classic Marquise Diamond Solitaire Engagement Ring shows this type of setting. This stunning solitaire features a 0.75 carat marquise diamond as the center stone set in an 18K white gold six-prong setting. The vast majority of marquise rings are set parallel to the finger, though antique and vintage designs with the stone placed parallel to the band can also be found. 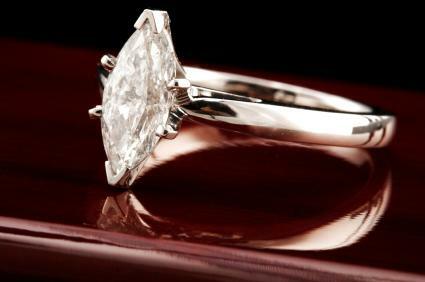 Finding a marquise engagement ring should not pose a problem since it is a popular choice for brides-to-be. This style of ring can often be found at local jewelry stores as well as online. For those who prefer to shop online, check out the following sites that carry a great selection of these rings. Zales features several styles of engagement rings with marquise diamonds, including a lovely Marquise Diamond Frame Split Shank Ring done in white platinum and uses a 7/8 carat marquise diamond as the center stone. The center is framed with smaller round diamonds as accents. It is priced around $5000. Marquise Engagement Ring in 10K Gold: Priced around $600, this ring features a marquise center diamond and round diamond accents set in a six-prong setting. Marquise Diamond Three Stone Ring: Set in 10K white gold, this eye-catching ring has a center marquise diamond accented with two companion marquise diamonds. It is priced around $2200. The distinctive marquise shape is believed to have originated in 18th century France under the rule of King Louis XIV, when he supposedly commissioned a new shape to mimic his mistress's sultry smile. The resulting narrow oval with tapered, pointed ends was named for that mistress, the Marquise de Pompadour. Because of their elongated shape, marquise diamonds may also be called boat-shapes or navette diamonds. 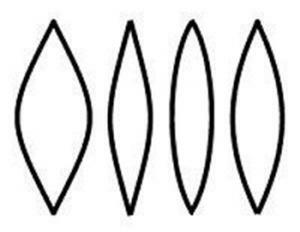 A marquise stone has a peculiar optical illusion effect. Because the stone's mass is concentrated in its table (top surface facet), the shape often presents the appearance of a larger stone than is actually present. Because marquise stones are often accented with additional diamonds in channels or prongs along the band, they also often appear to be larger than their true carat weight. The ideal proportion for a marquise stone is a 2-to-1 length-to-width ratio. This means that the most perfect example of a marquise (according to gemologists and jewelers) will be twice as long as it is wide. There is much variability in that ratio, however, and couples can select from a range of slightly different proportioned stones to find the one that best matches their preferences and design ideas. 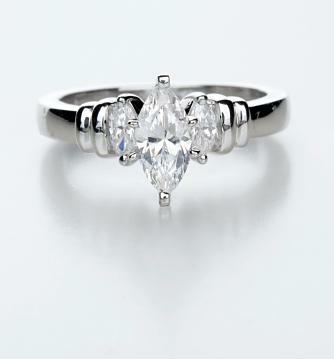 The experts at Blue Nile recommend a marquise proportion between 1.75-to-1 and 2.25-to-1. As the proportion of the stone changes, so does the "bow tie" effect within its depths. Because the marquise is a fancy cut rather than following the crystal's natural patterns, the intersecting curves generate a deep shadow shaped like a bow tie across the center of the stone. Some individuals see this as a flaw, while others consider it a part of the beauty and distinction of the cut. The bow tie is actually evidence of light leaking out of the stone rather than being fully reflected within it, and a large bow tie detracts from the stone's sparkle. In most properly cut stones, the bow tie effect is minimal, but couples should always investigate the stone thoroughly to ascertain the precision of its cut. When investigating individual rings, a couple needs to examine certain characteristics of a marquise stone to be sure they are purchasing a quality piece of jewelry. 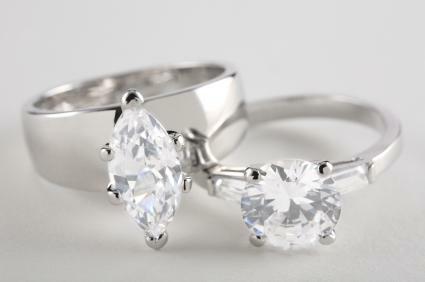 The prongs should both hold the gem secure and protect the tips of the stone. The symmetry of the cut should be even, with both curved sides matching and the points aligned with the stone's center. The bow tie should not be especially pronounced. The stone's color and clarity should be high -- the elongated shape can accentuate minor tints or flaws more than in compact shapes. The stone should be set properly on the band, not unintentionally offset or crooked. As with any jewelry purchase, it is prudent to ask about a diamond's certificate as well as any dealer warranties, guarantees, and other applicable policies before purchasing an engagement ring. Brides-to-be with long, slender fingers may find that the marquise shape accentuates the fingers without obscuring them. Couples on a budget. Marquise rings are often more affordable than round counterparts because they can be cut around flaws more easily and the carat size may not be as large for a similar visual appearance. 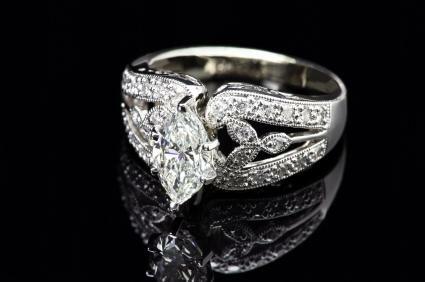 Couples interested in bridal set engagement rings. The tapered shape of a marquise is perfectly suited to additional ring enhancers and accent stones. Couples interested in a classic shape with an elegant, sophisticated twist. Round stones are the most popular, but for many couples, that popularity is too predictable. With slim, delicate elegance accentuated by sharp distinctive tips, marquise diamond engagement rings are a popular style for both traditional and modern designs. By knowing the particular characteristics of this fancy shape and how to inspect a quality ring, couples can easily choose an elegant marquise to symbolize the elegance and romance of their union.